Our Founder, Teddy Rebollo, a Spaniard living in the United States, started the Ibérico Club in San Francisco in 2013 with the mission of introducing the finest ham in the world, and part of the Spanish culture, to every food lover in the US. After achieving great success on the West Coast, we’ve moved our operations to Florida where we have our headquarters and warehouse. Since then, we’ve provided our unique products to several thousand happy customers in more than 200 cities in 47 states. As we continue working on our mission, we’d love your help: please share our website with your friends today! We aren’t a regular e-commerce company that offers hundreds of different products. 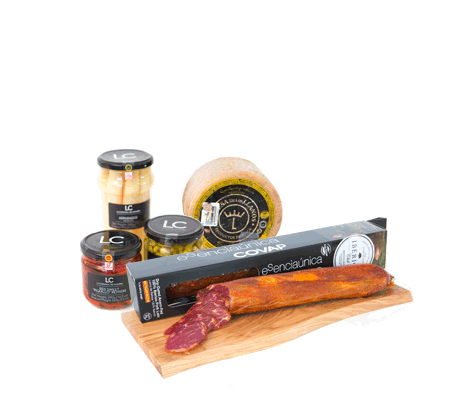 Instead, we believe in making a very special and curated selection of the finest artisan gourmet products from Spain. Our Maestro Jamonero handpicks the best Jamón Pata Negra in Spain, and we import it, along with other artisan gourmet products, by air in small batches to maintain freshness. Once the products are delivered to our warehouse, we send them straight to your door at a reasonable price. We offer 100% free shipping, 100% money back guarantee, 100% free returns, and 24/7 customer service. Jamón ibérico de Bellota is considered a culinary treasure in Spain and is internationally recognized by foodies and chefs as the best ham in the world; yet, it is still unknown to many American consumers. That’s why our mission is to introduce the finest ham in the world to every food lover throughout the United States. 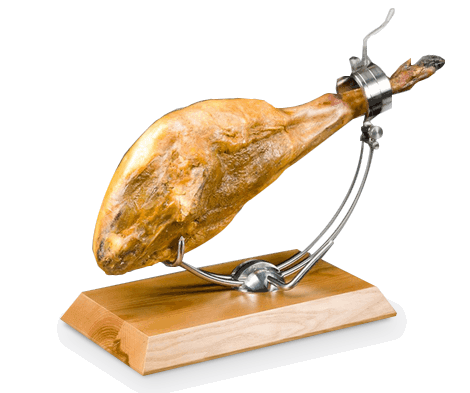 We’ve partnered with 300 farmers from Southwestern Spain to obtain the highest grade of ham on the planet, and have become the link between these artisanal farmers and your table. We want to thank the more than 300 “hero” farmers that maintain the artisanal and handcrafted processes that create this unique and world-recognized gourmet product. Our partners belong to the Farmers Cooperative of the Pedroches Valley (COVAP) in Southwestern Spain, where they have state-of-the-art processing facilities, and are inspected and certified by the USDA. Full traceability is ensured throughout the entire process, and extends through delivery of the final product. Ibérico Club’s jamón is the best in the USA, guaranteed. It is certified 100% pure Ibérico breed, and is fed only grass and acorns (“bellota”), is free range, and is certified humanely raised. It is never given any hormones, antibiotics, or GMOs, and is traceable from farm to table. It also has a Protected Denomination of Origin from El Valle de Los Pedroches, and, of course, is USDA approved. 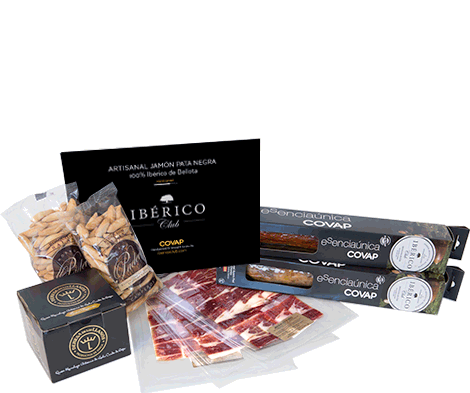 For generations, our artisanal farmers have been raising purebred Ibérico pigs in the South of Spain, and now it’s your chance to sample this delicacy in your home. 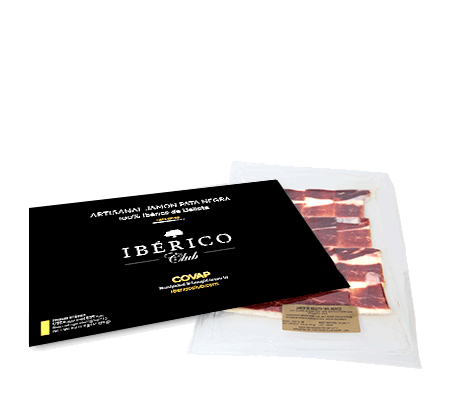 Whether it’s the centerpiece at a party or you’re sampling a slice on your own, Jamón Ibérico de Bellota is a product to be savored, never rushed. Known as the best ham in the world, this culinary treasure is full of intense flavor, with sweet and salty notes and a creamy texture. Carving an Ibérico ham by hand is simple, and is part of the unique Ibérico tasting process. To give you the most authentic experience, our whole Jamón Ibérico de Bellota comes with a holder* and a specialty ham knife. Let us show you the best way to slice your ham with our easy 5-step process. You can also download our carving guide for future reference. Step 1 Remove the outer layer of fat from the area you’re going to start eating. Place it aside to cover the meat once you’re done slicing. Step 2 Start cutting very thin, almost transparent slices. Keep the cutting surface flat, sharpen your knife frequently, and place the bite-sized slices on a plate. Step 3 When you find the hipbone, cut around it with your knife to separate it from the meat. This will make it easier to maintain a flat surface. Step 4 When you reach the bone, turn the ham over. Remove the layer of fat over the “babilla” (narrow side), and continue slicing. Step 5 When you reach the hipbone on this side, you’ll insert your knife again to separate it from the meat. Continue slicing the narrow side and the flank until you reach the bone. And remember not to throw the bone away – you can use it to make a delicious Jamón Ibérico de Bellota stock. Good sliced bread is a must! 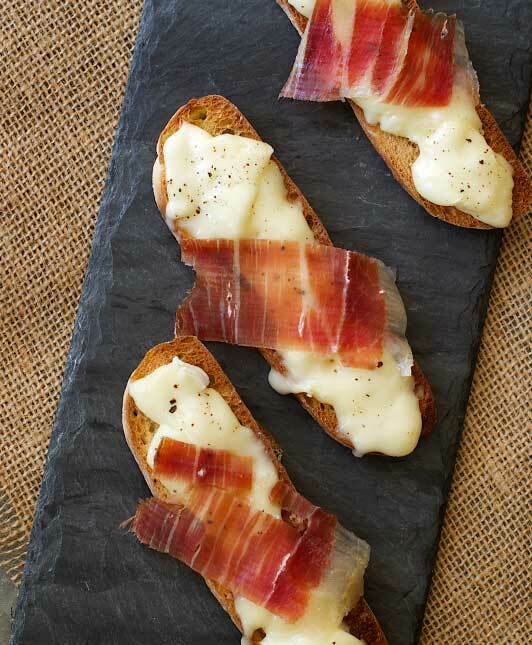 A thin slice of Jamón Ibérico on a slice of bread (toasted or not) is really all you need. Many jamón lovers like to rub the slice of toasted bread with tomato and garlic, and add a bit of olive oil. 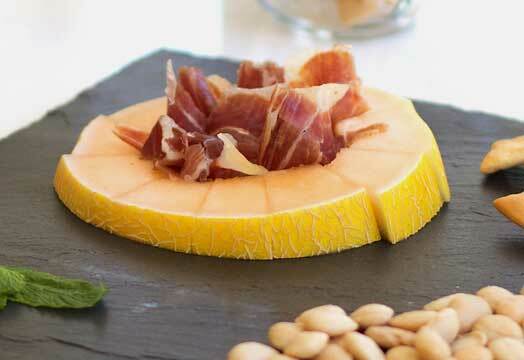 On a warm day, you may want to try a refreshing plate of our Jamón Ibérico with some sliced melon. Feeling adventurous? Visit our blog to find delicious recipe ideas. To properly eat your Jamón Ibérico, you must first prepare yourself for an out of this world culinary experience. Ready? Enjoy thin slices at room temperature. You’ll notice the savory flavor and satisfying mouth-feel. You’ll also pick up on the nutty undertones and sweet aroma created by the acorns that our free-range Ibérico pigs enjoy. This unique artisanal product is almost indescribable with its complex taste and deeply satisfying flavors. 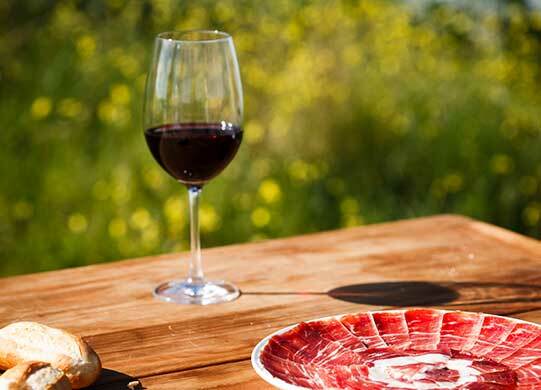 Pairing the right drink with your Jamón Ibérico depends entirely on your mood. It’s all a matter of personal taste. You’ll never go wrong with a glass of good red wine. For a special experience, try a nice sherry from Andalusia, Spain — the same region where our Jamón Ibérico is from. A sparkling wine, like champagne or cava, is preferred by others. And on a sunny, warm day, you might simply prefer a good cold beer with your Jamón Ibérico! If you have a vacuum-sealed pack of pre-sliced jamón, keep it refrigerated for 30 minutes before serving (do not freeze). Enjoy at room temperature! Eating Jamón Ibérico cold is like drinking a warm glass of champagne. Here’s a great tip if you can’t wait to open it: Place the vacuum sealed package in warm water for two minutes, then open it and put it slice by slice on a plate. Once opened, consume the same day. If you have a whole ham, it does not need refrigeration. Make sure you store it in a cool dry place away from direct sunlight (it will last for 1 year). Once you open the vacuum seal, place it in the ham holder and let it breathe for a while. Then you can start slicing and understanding why it is Spain’s national culinary treasure. Once you open it, it will last for 6 to 8 heavenly weeks, but make sure you cover the exposed surface with a few slices of the previously removed fat, and cover the ham with a cloth.